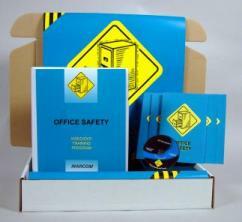 MARCOM's "Office Safety" Safety Meeting Kit™ shows employees what hazards exist in office environments, and how important it is to use good safety practices as they go about their work. Office employees frequently have the feeling that since they don't work "out on a plant floor" safety isn't important in their jobs. Yet accidents and injuries in the office account for thousands of hours of lost time, and millions of dollars in Workers' Compensation and medical costs. Materials in the kit include a video program, five motivational posters, and 30 employee booklets. The posters in the kit emphasize the importance of office safety. The videotape and employee booklets include information on safety awareness, proper lifting, safety housekeeping, slips, trips & falls, electrical safety, and more. The video program in the kit comes with a comprehensive leader's guide, reproducible scheduling & attendance form, employee quiz, training certificate and training log.